Why do you want me to let you in? So I can save you. From what I’m going to do to you if you don’t let me in. I’m guessing this will strike some of us as irreverent and misleading. But could it also help us see and hear ourselves the way others do? Could it help us hear our “Good News” as we’re telling it? Those who laugh at the story might actually have in their mind the same mental picture as we do—the one of Jesus standing at a door knocking. It seems to suggest the word picture of Revelation 3:20 where Jesus stands outside the door of people who believe in him without realizing how confused they are about how good he is or how much they need him. Since the “rude joke” has gotten under my skin, I’ve been wondering how to respond to the breakdown in communication. Am thinking the problem probably isn’t just one-sided. No one wants to hear, see, or believe bad news about themselves or those they love. Not the Christians in Laodicea (Rev 3:14-22); not those in the community who wanted nothing to do with that church; and probably not those of us who resent the joke others are telling on us. So how do we even begin to get right the Good News that a Jesus who died the way he did wants “in” to save us from ourselves and from what we are missing? Good morning Mart and friends. In our last subject I mentioned Kevin (Bear) who refused to listen to not only knocks at his door, but any advice that was offered once the visitor was inside. He has paid a terrible price for being stubborn. I haven’t heard or seen the joke Mart mentions, but then I have found that a lot of “comedians” aren’t funny. I’m not sure what to call it, but nearly everyone I know, including myself, has what appears to us as a clear sense of seeing what everyone else needs to do. I’m not sure if it is because we don’t recognize our own faults as much as not actually knowing all of the circumstances in another’s life that causes them to think, act and behave as they do. All the while emotionally disconnected we can easily plot a course of action for another. We are after all on the outside looking in. In Mart’s scenario Jesus is outside the door, but wanting to be invited in. Once in He can advise, instruct, urge and offer aid, but we must be open and willing to allow Him to have His way. Nothing He offers does us any good if we hear, but don’t listen, insisting on just going on with who we are, comfortable with ourselves just the way we are. Here in my home dealing with the circumstance we given, Matt often misunderstands what I may say and sometimes even what I haven’t said. I have learned that the only way to respond is to be patient, either ask for clarification or offer it. Never insisting that I may be right, but rather offering the possibility that I may have been wrong and building on a mutual desire not to be offended or offend. As for the internet joke, sometimes silence speaks louder than words. Once upon a time I was proud to be an evangelical Christian. It is heady stuff to believe that you hold the key to eternal life for unbelievers. But there were things about spreading the gospel that bothered me. “Turn or burn.” was a saying used at the Baptist high school my husband attended. While I hope it was never used with unbelievers, it was used among the students. And they talked of notches on their stick, a way of measuring their worth by how many people they had ‘saved’. And leading someone down what they called the Romans Road was all the evidence needed to put another notch on your stick. This is not love. This is a way to put yourself above other people. I think there is something better. I am not evangelical anymore. I think that the good news is that Jesus has paid the price and that his creation, all of it, will be redeemed. Maybe for some of us with eyes to see and ears to hear, that redemption begins in this life. Maybe for those who haven’t yet been given eyes to see and ears to hear, this redemption comes in the next life. My heart goes out to Steve’s friend Kevin (Bear). I know some just like him. I suspect their stubbornness results from a mix of both nature and nurture. They don’t yet have those eyes to see and ears to hear. Isn’t there a verse that says, “What do you have that you have not been given?” Were he my brother, son, grandson, I would never give up hope that he will one day be able to see and hear the good news. A little wait before Matt’s next move and so I have been exploring a few possibilities concerning our new subject. I am reminded that Jesus was mocked at His arrest, trial and even as He hung on the cross. He ask the Father to forgive them because of their ignorance. Of course there is no “e” in ignorant which is what makes the comment a joke and laughable. While there is nothing funny about the crucifixion, I can imagine some humor surrounding the reactions of some of the by-standers witnessing the many miracles Jesus performed. Today with so many people hooked up to instant social media there is almost nothing anyone can say in jest that isn’t taken the wrong way and twisted into an insult. Caution and consideration should always lead our conversations. Hello dear friend Saled, I hope winter hasn’t been too hard on you up there in Maine. Good to read your comment. Yes saled just like Jesus never gives up knocking on our door. With Kevin, even though I do not like to talk about people without their permission, if someone kept knocking and showed him love he might eventually open the door gladly as I said in the last topic because love always finds a way. It would seem even though I do not know him that maybe rejecting people before they can reject him is a safe zone to be in. I would imagine that people gave up on him long ago because they did not visit him or he would not have been in the shape he was in. Sending him a card in the mail over and over again, or bringing him a meal and sitting it by his door, or cleaning up his yard or mowing his lawn without being asked are kindnesses that can result in showing him that he is loved. I have spent more time running from God than running to Him as the truth is I was taught to see God as a God of wrath rather than a God of love. By being told often that vengeance is the Lord’s and by seeing my communities respond to violence by using more violence and justifying it as God’s eye for an eye it took me a long time to see God in another light. It was my dad whose example I began to see as a man enlightened by God rather than blinded by vengeance. As Steve says there are consequences to stubbornness as if I had listened to my dad instead of following the crowd I would have seen that God’s Way leads to higher ground as God reveals His Ways to those worthy of accepting them. I am much more like the Kevin’s of this world than I am the Jack’s (Dad) affectionately known though christianed John James as the consequences of my waywardness has affected me mentally and so I find that Christ is my refuge as I am always in need of rescue in my mind which is what so often rules my heart these days. Saled, I love your thinking that Jesus paid the price and as we are on different journey’s there will be different redemption times. Like yourself I have experienced arrogance in other believers so that I have begun to see that it isn’t just Catholics hate Protestants or vice versa but denominations are down right nasty and demeaning of others because they believe they are chosen above another which doesn’t show humility or compassion to my way of thinking. My friend once admitted to me that she couldn’t wait (she believes she is chosen) to make those Catholics suffer for what they have made us suffer and there is something badly wrong with this kind of thinking but she has had her mind turned because the IRA wanted to take out anything British and predominately Protestants hear see themselves as British and so where legitimate targets for the IRA. Life is complex and I need to trust God because the more complexing the world gets then the more I know only He can put to right that which is wrong in it. As for rude jokes I worked in a male dominated environment and soon found the harder you protest the worse the jokes get so resilience comes to mind as usually when the joker finds it is having no effect it looses its funniness. I am not sure how to get the ‘Goods News’ right as that ships seems to have sailed as both religions and individuals have gone their own way in seeing God as they do. The ‘Good News’ is that God hasn’t changed but it seems people will continue to change God to their own ends as it justifies them in seeking vengeance or justice which many see as God’s will. If you loose a loved one in a violent way then I understand a person’s need to see God in this light and so I cannot judge another’s view of God and why we do see God so differently. the joke is secular and pertinent from the perspective of a world view. the flow is good but it takes a detour, like where we find ourselves many times. save from what? no mention of sin and death? how about everybody dies? true, Jesus did die, but He lives and He still speaks. even the blood of able still speaks and of coarse there is the famous I AM talk with moses. if i remember right, what we do to others, God will do to us, same measure. boy do i need a Savior! i have condemned so many people how can i escape such a fated? when does the switch from judgment and condemnation change to intersession. if i remember right, in jobs case it started the day he withdrew his court case against God. i like the fact job received everything he needed in the pretrial. and finally he was restored. Mart I like the way you end this. More of a positive view than the ‘hell fire and examination’ view. Focusing on Gods goodness is best, but it takes a rethinking, not necessarily changing denominations but changing our thinking. When I focus on the goodness of God, beginning with the first act of mercy, clothing A and E, I see His goodness and mercy. But if I focus on the wars, catastrophes and judgements my preaching becomes just as harsh. I too am not ashamed to be a reformed Baptist. Lol that’s damnation not examination, although examining is so important. Both myself and the evidence for Christianity. it’s funny how we come up with labels to identify ourselves and others. it like building fences or putting people in boxes. if i remember right, “you will be “My” witness.” people i find can be unreliable witnesses. first person witnesses are the best. don’t render a verdict till your ready. job was asked to speak to God, by God, but put his hand over his mouth, he was not ready. he wanted to Know. it came by faith. then he rendered a verdict. his verdict/faith is correct proving he was a righteous man. the Old Testament singles out noah job and daniel above all others. noah living in obedience in a fallen world, job suffering in a fallen world, daniel looking forward to a new world. then Jesus single out john as the greatest prophet to ever live. the plot continues. who’s there? Jesus who died the way he did wants “in” to save us from ourselves and from what we are missing? not to be missed the Word of God, the Grace of God, the Spirit of God, the Love of God, the Mercy of God, ……………………the Fruit of the Spirit. to give as freely as it continues to you. some things never change. Than tongue or pen can ever tell. And reaches to the lowest hell. I understand what Mart is saying. I will not respond to questions about what he is saying. Nothing left to say. . . impasse. 4 I give thanks to my God always for you because of the grace of God that was given you in Christ Jesus, 5 that in every way you were enriched in him in all speech and all knowledge— 6 even as the testimony about Christ was confirmed among you— 7 so that you are not lacking in any gift, as you wait for the revealing of our Lord Jesus Christ, 8 who will sustain you to the end, guiltless in the day of our Lord Jesus Christ. 9 God is faithful, by whom you were called into the fellowship of his Son, Jesus Christ our Lord. Since the “rude joke” has gotten under my skin, I’ve been wondering how to respond to the breakdown in communication. Am thinking the problem probably isn’t just one-sided. thinking about light and dark…there is no agreement between the two. one thing to remember, we were in the dark at one time. how did you get out of it? what puts you back into it? seek ask knock? 3 For this is the love of God, that we keep His commandments; and His commandments are not burdensome. 4 For whatever is born of God overcomes the world; and this is the victory that has overcome the world—our faith. 5 Who is the one who overcomes the world, but he who believes that Jesus is the Son of God? as i thought of this, a conversation i had recently with some one got their dander up. distressing to say the least. anyway i think it had to do with the conflict of the calvin and armenian view. nice big mine fields that lay just below the surface. good news is better received by all before a mine goes off, but sometimes it doesn’t work that way. martin luther and others know this first hand. seems like you wait till their in distress, then give the good news. i have been the barrier of bad new before. so how can the good news be bad news? i heard the gates of hell will not prevail. it seems joshua received a battle plan. what is the battle plan of the Great Commission. com-mission with-mission. Emanuel. i have to admit sometimes we don’t see to well. our daily bread today. i remember being a kid and couldn’t wait to grow up! funny how things repeat themselves. the three majors of self. it’s interesting how love arrests envy coveting and lust. it would seem if one could love, they could shine in the dark. Bubbles, you are writing what I am thinking too. As if Jesus is the bad guy. Asking God that I did found this way of words difficult: Kiss the Son, lest He be angry? Is that how a husband attracks a wife? That is how the maffia works: Pay us,then we will protect you, or else we will attack you. Micah 7:18 You do not stay angry forever, but delight to show mercy. Till a pastor had a sermon, he was telling about a walk in the mountains with his family, and his youngest son would go close to the edge of the mountain, very close, when the father turned around and saw that, he got very angry! And in that state he commanded his son NOT to do that. When I heard him say that, I thought, OK, THAT is the way to look at the anger of God. He does not want us to get lost. If God is angry then He has good reason to be so I need to take a long hard look at myself and the difficulty there is that I don’t always like what I see so I bury my head in the sand instead of facing the truth that God wants me to know. I justify myself by telling myself that God shouldn’t be angry with me because it isn’t my fault and I pass the buck to my parents or whoever comes to mind. It isn’t until I admit that God has a right to be angry that I agree with Him and feel repentance and in doing so see that God’s intention is good. It isn’t until I am honest with myself that there is a lot needs changing that I see the need to let Jesus in and I need to ask myself why is that and the answer I have come up with is that I seem to need an angry God more than I need a compassionate Jesus! I am holding on to God’s anger rather than allowing Jesus in and and that troubles me greatly because it is NOT what God wants for me! Why am I more drawn to an angry God than a compassionate Jesus and the answer for me is struggles of the mind and wanting God to see it my way when I know in my heart that is not going to happen. I think of ‘Jonah’ and how He didn’t want God to forgive his enemies and I now understand how Jonah felt. C. S. Lewis put it in a nutshell in this quote! Hidden in this subject are two issues surrounding God and man, life and the future of mankind. Explained there in Ecclesiastes 3:1-8 KJV is that there is a time for everything. In Luke 21:24 KJV states that there is a time when the Gentile is fulfilled. There is a belief that the Flood of Noah was predicted and even preached to the people of earth well before it happened. Yet only Noah was found to have the faith to receive grace. His family wasn’t mentioned as having been found likewise, but because of Noah they too were spared. People were warned, but they paid no heed and so died in the flood. Yet there in 1 Peter 3:18-20 KJV Jesus still offered them the Gospel after they were dead and in prison (that place of suffering). Every person gets to hear the knock at the door and offer of Salvation. Every person gets to make the choice. We have lived under a period of grace since the cross, we followers of Jesus were given the job of spreading the Word and the Word has been spread, but there is a time when all have heard and time runs out. There is another great tribulation coming, not as complete as the first whereas only 8 people lived through it, but one that will kill 1/3 of all life on earth and usher in the 1000 year reign of Christ. Like the first we are offered a place of safety on the Ark. 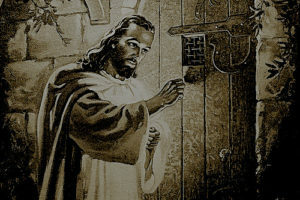 Jesus knocks at the door and warns us of a coming disaster. In the story of Sodom and Gomorrah again we see the same thing applied. The angels warned of what lay ahead yet Lot’s sons-in law’s decided to stay. Yes people are tired of hearing about Jesus and His offer of Salvation, because time is running out, if not almost ran out. They have hardened their hearts to hearing the Holy Spirits tug and have no fear of what a future without God in it means. Science and self-gratification have become their gods. If you could hear the taunts Noah must have heard about building a ship in the middle of a desert, they may have sounded similar to the insulting joke Mart mentioned. Jesus knocks at the door and offers a better way to live now, an escape from coming disaster, and eternal life in paradise. He offers no threat only an offer of escape and eternal protection. It is serious, not a joke. God is good all the time and once I see that I know that whatever demons attack my mind are temporary and cannot hurt me other than the discomfort they cause in my mind. God has overcome the world and the evil in it and whatever my circumstances it is remembering that He is triumphant that gives me peace today. He will make a way where there seems to be no way and how often have I seen Him do that in my lifetime and so when I get doubts or fears I remember God’s goodness is greater than any badness this world has to offer. Jesus’s world is very different to mine and that makes me truly thankful and hopeful of a better world to come either on earth or in the sky. Breakdown in communication isn’t one-sided it takes two or in some cases more, well unless one is talking to themselves, lol. Well even then if we have deceived ourselves about where the fault lies. Blame is a very sad state of affairs, that seems to say it is always someone else who is at fault for our reactions to them. It seems if the “Good News” has found a place in our hearts and minds then He teaches us rather than reaction based communication to respond as He did and does. Process. If our focus is on God it would then follow that that “Good News” would come pouring out if we believe it to be true. I wonder if one really understands what that “Good News” is or they have filled their minds with such hooey they have lost sight of it? I wonder if it is possible to ask Him in and then put Him in a corner not to be heard from again well unless one finds themselves in a pickle, then call Him from the corner to fix something otherwise not seeking after Him in any other capacity like daily life. In our bible study this week one of the questions was, “Do you remember the time when you turned your life over to the Lord?” and “What did it mean to you?”. If my relationship with God is not right then I am to blame as God expects me to take responsibility for my failings and I either bury my head in the sand or I want to change and I am much more aware of burying my head in the sand. If I want I can find someone else to blame but God wants me to come to Him because He won’t be able to help me if I keep running away from Him when I should be running to Him. I am done playing the blame game as I have blamed everyone but myself only to find that it is ‘ME’ God wants to change so I am chasing my own tail because of ignorance of God’s intentions. Viv there was a time when I was very badly wounded by a Christian counselor and I wanted God to be angry about the severe trauma I had been caused. I know how you feel! God is very very angry about sin. I had to forgive the counselor, it was the hardest yet at the time the sweetest thing. Vengeance is mine, I will repay, says the LORD. Then how does He repay? By dying for my counselor’s sins, past present future, as well as mine. All have sinned and fall short of the glory of God. He’s tough on sin. But merciful gracious and self denying at the cross. And He’s our example. I am reminded once again of Kevin. His friends and even his estranged family did not quit nor give up with him until he gave in and allowed for help to come. In the same way I am equally reminded of the story of the friends of the paraplegic who broke through the roof of Peter’s house in order to get their friend to Jesus. If you know someone who needs to answer the knock of Jesus at their door and allow for their salvation to come. Don’t be dismayed by taunts or jokes or insults, as our friend and sister in the Lord Viv has said, “Onward Christian Soldiers” stay the course and never give up…Keep knocking. Sorry Pat it was you who talked about you and your family singing “Onward Christian Soldiers”, Viv is so associated with music to me I too quickly went to her instead of “thinking”. The King Preaching The Kingdom has come near. God gives government a sword and power to punish lawlessness. we are told later, All Authority in Heaven and on Earth has been given to Jesus. we are told God will make the rulers of the world into nothing and it’s judges worthless. puts a new spin on judgement. job’s three friends got into trouble judging, job got himself painted into a corner, then a deliver shows up. One we can put our trust in. one of the most difficult things about God is when He puts on His Judicial Robe and must uphold justice and righteousness. thinking about the Alter of Incense where the High Priest offers His Prayers and the prayers of the Saints. seems to me you better be in Christ in this moment, a Passover. we are also told this is the Most Holy Place and it is outside the vale. If it pleases the king, let a royal edict be issued by him and let it be written in the laws of Persia and Media so that it cannot be repealed, that Vashti may no longer come into the presence of King Ahasuerus, and let the king give her royal position to another who is more worthy than she. Jesus is Lord and Deliver. His mercy is new every morning. the reason we don’t see forgiveness, we don’t see the offense. sometimes we see the offense and chose not to forgive. if the offense is removed, why not forgive anyway? i like pauls use of turning one over to satan. he does things we would refuse to do. then again we have done things we should not have done. israel faced many times in her history where it seemed like God removed His protection. they are still protected. He never stop loving them. tough love, and certain. pray for peace in the Temple. thinking of samson in a foreign temple. Street i was just reading about Pastor McDonald. Your thoughts for my reaction to his leaving. God is still in control, even in the fiery furnace!! even jonah ran for awhile…elisha ran to a cave before he stopped….david did a lot of running…sometimes i think it’s chase me and find me. yet it is my eyes that are at fault not His. we are not told of a wrestling match with jonah, but we can sense one was brewing, but we are told of one with jacob. it is difficult to come into God’s present’s, but i hear even the blind & lame can find their way into it. “Enter through the narrow gate. For wide is the gate and broad is the road that leads to destruction, and many enter through it. But small is the gate and narrow the road that leads to life, and only a few find it. the way, the truth, the life, Jesus. The blind and the lame came to him at the temple, and he healed them. The people were amazed when they saw the mute speaking, the crippled made well, the lame walking and the blind seeing. And they praised the God of Israel. were these disciples of john, Jesus first witness? maybe the first that were sent. i remember moses finding himself in God’s presents and he was not evening trying. now trying is an interesting word. I counsel you to buy from me gold refined in the fire, so you can become rich; and white clothes to wear, so you can cover your shameful nakedness; and salve to put on your eyes, so you can see. knowing who to listen to makes all the difference in the world. God, let us hear your voice. give us strength to do your will. you gave us Your Holy Spirit. make us One with Him. Please pray for safety for missionaries being evacuated from Haiti currently due to fighting and political troubles. “So how do we even begin to get right the good news that a Jesus who died the way he did wants “in” to save us from ourselves and from what we are missing?” Mart ends with this question. I recently read a quote from one writer and shared by another of my favorite writers: “Jesus did not so much love people once they changed, but he loved people so that they could change.” The writer who shared this said that Jesus accused only the accusers. Maybe this is where we should start in sharing the good news. In loving people so they CAN change. Several verses in the New Testament refer to ‘those who are far off’. I see people like Steve’s friend Kevin as at least once upon a time, being in this category. Some of us grow up without the social skills and/or brain chemistry to form connections with other people. I understand this as I struggle with it myself. I am very clumsy socially and am blessed with strong family relationships but am not a good friend. I am thankful for relationships in a workplace where I can function and am supported. Church has always seemed a social place where I didn’t truly fit. It was painful to attend any functions where people were expected to ‘mingle’. Finally I realized that I was one of the ‘far off’ who will be made ‘near’. It is OK to be who I am and I have hope that I will be brought near. I think maybe our concept of sin turns us into accusers, as though people always have a choice of “good and evil, life and death” as Moses put it. Who am I to question Moses? But I believe that people have less control over their choices than we would like to think. I think this is how to make people notice the good news. And it is happening in many places. And you can’t predict where by denomination name or anything else. I apologize to the denomination that I mentioned in my first post on this subject. This kind of love is found in some who name themselves that way also. I need you like I never have before. 15 “Because you have said, ‘The Lord has raised up prophets for us in Babylon’— 16 for thus says the Lord concerning the king who sits on the throne of David, and concerning all the people who dwell in this city, your brothers who did not go with you into exile— 17 thus says the Lord of hosts, ‘Behold, I am sending upon them the sword, famine and pestilence, and I will make them like split-open figs that cannot be eaten due to rottenness. 18 I will pursue them with the sword, with famine and with pestilence; and I will make them a terror to all the kingdoms of the earth, to be a curse and a horror and a hissing, and a reproach among all the nations where I have driven them, 19 because they have not listened to My words,’ declares the Lord, ‘which I sent to them again and again by My servants the prophets; but you did not listen,’ declares the Lord. 20 You, therefore, hear the word of the Lord, all you exiles, whom I have sent away from Jerusalem to Babylon. as i read this i think of the unchanging God Who shows no partiality. the same yesterday today and tomorrow. i been thinking about the idea of living in heaven with no internal corruption at all. sometimes the corruption is overwhelming to think about and so discouraging. david found this place and wrote a Psalm about it. Jesus speaks about going away in the upper room and encourages us by telling us He’s preparing a place for us and returning for us, by promise. looking to the One Who was lifted up and then Exalted to the Highest place. i wonder if the babylonian captivity was a generous gift to the gentiles who would have come into contact with the God of israel. we do know some showed up at His Birth. yes some israel’s showed up too. thinking do not miss the power and grace of these stories. For our proud confidence is this: the testimony of our conscience, that in holiness and godly sincerity, not in fleshly wisdom but in the grace of God, we have conducted ourselves in the world, and especially toward you. our confidence in His Spirit, not ourselves? thinking of paul despairing. one place for holiness and godly sincerity….in Christ. saled, I believe people have control over their choices and actions all the time but do not take the time to pull back and consider their options or maybe they are not aware that they have other options because they have not answered the door and let Jesus in. People seem to be in a continuous battle you know sort of like the picture of an angel sitting on one shoulder and the devil sitting on the other, the devil(flesh) screams out how to do things while the angel(Spirit) gently whispers. Don’t we have a choice which we listen to? Inviting Jesus in opens a whole new world, new way of doing things, new ways of thinking just a whole new way of life. We can choose to look at the glass half full with hope He will continue filling it with Himself as we slowly let go of listening to self, the world and the flesh that screams at us daily rather than that of Spirit within that produces love, joy, peace, patience, kindness, gentleness, goodness, faithfulness and SELF CONTROL. I have never seen or heard Jesus ask me to do something that He has not given the power to accomplish it. It is in His strength and power that we are able to live this new life. Does He expect us to do it perfectly, no, that is where the Good News comes in so we do not live with shame and guilt but in and under forgiveness and restoration. Jesus said, “I have come to call not those who THINK they are righteous(accusers), but those who know they are sinners(the accused) and need to repent.”(Matt 9:13; Mark 2:17; Luke 5:31) As the knock, knock joke implies “Save me from what?” could it be self righteousness or pride? Isn’t life too short to use time being unkind and argumentative? Yes, that is true Saled as another person’s actions creates difficulties in our lives that we don’t have choices other than to accept the situation as it is. I was born British in what the IRA see as occupied Ireland so I have become a legitimate target by birthright for those who feel justified in taking Ireland back as their country. That as caused me great pain in my life, loss of loved ones and friends who were dear to me and consequently feeling hatred towards my enemies resulting in guilt and shame because I am aware that not loving my enemies is not loving God. It isn’t until you have been personally affected can you understand how difficult forgiveness can be as this is not about me falling out with my neighbour or a member of my church where I can reconcile. Some of the difficulties are in God’s hands because man has not solved them and history has been rewritten enough times for us to see that man messes up more than he cleans up or that is how I see it as I feel very much a part of the mess. My mother would say the worst war is guerrilla war and having now lived through it I understand exactly what she meant. The war within a country creates mistrust because the terrorists cannot survive without the support and sympathy of the population and so whom do you trust when enemies are everywhere but incognito. I have very good reasons for only trusting God today and the main one is that I find He is the only one I can trust. Isn’t it a choice “to accept” the fact that we can not change other people only God can do that. Isn’t it a choice to trust God? Doesn’t God work in the heart of those who believe in Him to change how we look at Him, ourselves and others? If we say we trust in God but then do not forgive as He forgave us, do we really trust in God? How about the harm we have done to our relationship with God by sinning, so do we want His forgiveness? We need His help to go through the process of forgiveness and I think it begins with me understanding all that I have been forgiven for so how can I not give what I received even though I did nothing to deserve it. It comes down to understanding that I did nothing to deserve it, so no one else deserves forgiveness either BUT God through Jesus Christ did it anyway. I was accused of not applying scripture correctly I hope I did it correctly above, if not please forgive me Lord for not applying your word correctly after all it is a great responsibility for us to share it appropriately. saled, when you posted that on facebook the other day I thought of the accusers of the sinful woman who anointed Jesus’s feet in Luke 7 and especially Luke 7:47 NLT. I enjoyed that as much today as I did then. I do not think I can ever hear it enough thank you for bringing it on here. One of the difficulties of driving in winter is when roads are covered in snow and snow is piled up at intersections you can’t see who’s coming unless you sit on your front bumper (having a good friend is important, lol) or the other way is common, slowly inching your way into the intersection hoping no one clips you before you see them coming—- which is everyone’s complaint now days. One lady drove right into a snow drift in our parking lot because she could not see it for the snow, lol. Yes it’s that bad around here. Reminds me of winters of the 40s 50s 60s. When I got married in ‘71 we drove 90 some miles in a blizzard to get to the JP. It was so bad our friend opened his door to tell us where the road was and to avoid stranded cars. One storm I’ll never forget. We made it taking an hour longer than normal, only to get stuck in a 4 ft drift on the road after our nuptials. My husband had to carry me from the car (of course being 20 I was not dressed for the weather , too unfashionable, lol) ending up on my mother-in-law’s sofa for the night! Not lol. 3 years later I and my 18 month old baby girl were trapped in our home for 3 days in a super bowl blizzard without heat, the temp was 35 in the house when my husband and snowmobile rescue team could get to our rural location and safely bring us to a neighboring house with a fire place. We rode in a tube like contraption pulled by the snowmobile. God spared us because the sewer fumes inside from frozen vent were so strong they said it could have killed us! Who’s there? Always God, always, and He is sooo good, always. What an amazing world we live in. Today many people have a camera that shows them who is at the door. When we tell people we are a Christian, immediately we are under scrutiny to see if we live up to “their” expectations of what a Christian looks like. “Looks like”, includes behavior, habits, actions and attitude. To the plethora of Protestant denominations, each denomination tends to think their particular gathering has it right and all the others simply don’t. One thing most all Protestant groups agree on is that they don’t like Catholics, whereas most Catholics think all Protestants are going to hell for not really being Christian at all. To the secular world most, not all, people who consider themselves Christian are hypocrites. The secular world are the ones we are to introduce to Jesus, the ones we are commanded to share the Gospel with. When we try and reintroduce the Gospel to other Christians we step into a combative arena where the secular world steps back and observes just how Christians react with not the world view, but with disagreement within their own “kind”. This becomes our hour of opportunity to show Jesus. Does arguing over every little thing show Jesus or show you? You are so very right Bubbles, life is too short for arguing. Nowhere in that list is there a mention of demanding to have it your way or insisting to lord over anyone who disagrees with you. Nowhere in that list empowers you to argue with another. The camera is on you, who is it knocking at the door? You or Jesus? 29 degrees f and a clear sky. How is that you so simply and wisely get to the grit of it. We are in the limelight. All eyes are on us, and not only from those who are on the outside; we are under scrutiny from within our Christian circles too . I am keenly aware of those eyes and yes, if I am honest, it can be a bit overwhelming for me because of having to analyze my every move and word. What are my actions saying? Was that response tempered in kindness. What are people seeing? Am I behaving as a child of the Great I AM should? I can only guess that that is what it is like to grow up in a royal household where proper etiquette and form is a must in all circumstances..whether outside the palace for the public to see or within where the hired staff can see. And to be honest, there are many times, when in the quiet of the darkened day and looking back to how it went, I do cop out and say “well I am just a forgiven sinner anyway”. Yes I am grateful for that truth but at the same time, there is a disappointed sickening feeling too….for I know my actions and words weren’t becoming for a child of the Great I AM. I know in my spirit that I’ve let Him down. Father please forgive me for today and the things I said or did that were displeasing and wrong. And should You allow me another day, help me, I pray, to wear Your name as I should, in Your strength and mercy. Amen. Very true, Steve, I have no right saying I am a Christian until I can practice what I preach which is why I prefer to say I am a believer because I don’t see myself as transformed with having too many struggles with my own demons. If there is something raising its ugly head and making me angry then I am not yet right with God and I know that because my enemies can still make me mad today by their taunts. I see our younger generation turning away from our churches because of what happened between Protestants and Catholics and there has been a lot of Protestants marrying Catholics in civil ceremonies and neither are practising their faith any more. I wasn’t brought up to hate Roman Catholics but I know too many Protestants that where and I am glad to see that love has found a way to break down the barriers with a younger generation and give hope for a different future for them than what we had. Jesus said that the world would know who He was, because His followers were ONE. We have a lot of work to do, just inside the christian community to get ONE. Promise me, that when you come home that you would read the bible as a child. The youmg mormon did not change at once, he cannot remember a specific moment, he said it took about 18 months, or so, to be immersed in the New Testament. Slowly it got to him. Now, years later, his whole family is out, and they started a mission to reach out to the mormon community. Then I thought, these are good moments. and now through the Holy Spirit wants to strengthen us to live a life in Him. Well, this is not a perfect faith expression, but something like this. My former church made a huge point that the Sabbath rest should be kept from friday night sunset, to Saturdaynight sunset. We were the only one who had it right, all the other christians were sincere, but wrong. O dear, I have said sorry for that many times, but while writing this I still feel that is was a shameful judgment. God has forgiven me, and my old church. God has thrown that mistake into the ocean, and it is gone. The cathlics think that at the Euacharist, the bread literally becomes the body of Christ. And the bread becomes sacred. THat is the whole truth. And all who do not believe that are not real christians. A lot of coming together of the christians has to come. That is not about interpreting scripture in different ways, but about the flesh that is not crucified. 60 procent of the Cardinals is homosexual. And that is not fake-news, the writer did a thorough research. “Undercover”, meeting many in the Vatican, and around the world, and talking with them. May God help this church, and help the pope in dealing with this matter. God wants us to be perfect, He knows we cannot be perfect, but when a priest is abusing his “sheep” that is not to be treated as a light matter, that you just forgive the person, and send the priest to another parish. These things have to be brought out into the open. Openly speaking about it, and openly saying that you are sorry. Otherwise the same sin goes underground and comes again years later. Saled, thank you very much for explaining yourself a bit more, that touched my heart! May God bless you very very much! Help me understand where God wants us to be perfect in anyway other way than loving our enemies as He loved us while we were still his enemies? Matt 5: 43 “You have heard the law that says, ‘Love your neighbor’ and hate your enemy. 44 But I say, love your enemies! Pray for those who persecute you! 45 In that way, you will be acting as true children of your Father in heaven. For he gives his sunlight to both the evil and the good, and he sends rain on the just and the unjust alike. 46 If you love only those who love you, what reward is there for that? Even corrupt tax collectors do that much. 47 If you are kind only to your friends, how are you different from anyone else? Even pagans do that. 48 But you are to be perfect, even as your Father in heaven is perfect. That is one way, loving our enemies, people see the difference in our lives that make us followers of Christ, another is forgiving when we have been offended with or without admission of guilt from the person we are forgiving. Showing grace and mercy to people who do not deserve it just like Jesus did for us. That is what makes us different. We still sin just like every other person in the world but thinking we don’t is where that kind of thinking goes wrong just as Mart shared in the joke “Save me from what?”. If the door has been opened and Jesus has come in we know what we are saved from! Forgiving someone does not mean they will not suffer consequences of their choices, it means we are not going to hold on to anger and resentment towards them. It does not mean we are going to make excuses for them and call good what is evil but we let God and the authorities take care of consequences. Pooh, when the Good Friday Agreement was made it came at a price and that price was the early release of prisoners some who had committed murder. On a visit to an elderly Roman Catholic woman she told me of how she had met one of these early released prisoners and how well he was looking and she had spoken to him and he had got his degree in prison and was now a music teacher. She was angry about this because she knew the member of the security forces whom he had murdered and she spoke of how he had been such an easy target walking to his work every morning and he left behind a wife and 3 children. Does it seem right to you to reward evil, because, it doesn’t seem right to my way of thinking and yet the authorities in their wisdom are doing just that. By appeasing terrorists many of the families of the security forces who gave their lives in defence of the country are now angry and with good reason because many of them are husband less and fatherless and struggling to bring up families. Free education for doing evil and a life of struggles for those who did what was right so please don’t ask me to trust authorities because at least I know what to expect from my enemies. Could I please ask all of you to pray for some sweet children where I work? There are two situations that are breaking my heart. Thank you. .
Praying for these children, Bubbles. Joining with Saled and others in your request for prayer, Bubbles. Good morning all. Foreverblessed it is exciting and comforting to read your thoughts were in line with mine as you mentioned. The same Holy Spirit that leads me leads you and speaks to all who have accepted Jesus as Lord. Thank you for conformation. Equally Pat and Viv, it is a necessary part of being in fellowship that we uplift each other, comfort each other and encourage each other, thank you as well. Mart has offered us a wonderful gift here in an opportunity to showcase Jesus in our lives. We are offered the incredible opportunity to be broadcast all around the world to different countries and cultures our views, but more importantly to share our views from a heart of Christ. We must always remember who it is we represent as we come here and set down with each other. We are His witnesses and His clouds of glory. When I think of that comment from Revelation as Jesus coming with His clouds of glory, in my mind I always see that beautiful scene of the sunburst shining through and around clouds producing shards and beams of light emanating from the sunlit sky. And if I listen I can hear the singing of countless numbers of angles as they proclaim Him to be the King of Kings and Lord of Lords. From Sunday morning reflections to encourage us that our prayers are heard and to hold fast to our faith in Christ. For the Conqueror has risen! Ev’ry eye and heart shall see Him. Of a servant good and faithful. bubbles, praying for the children. Viv, is the anger that those people are holding on to in any way affecting those they are angry with? Or is the anger causing the one’s who hold on to it to be bitter, resentful and full of hate? Those prisoners were released but the one’s who hold on to the anger are still in a prison of sorts. The people who go to prison are sent there to be punished and be reformed so they will not commit any more crimes but how does one help the victims? Wouldn’t it be by helping them to let go of the anger to get on with their lives and not pass the hate down to their children so they to can be free? Remember the sermon Jesus gave in the Be-Attitudes. Opening the door to Jesus opens a heart and mind to be transformed into His image not as the world and flesh does with accusations, insults, bitterness, hate, rejection but the complete opposite with acceptance, encouragement, peace and joy. At this moment in time I can agree with what you are saying Pooh, but when I was in the midst of the troubles and the war was raging I seen it very differently, also, I am not the one who has loved ones buried whose bodies have never been found and so the families have not been able to put them to rest. Many of them just want a Christian burial for their loved ones and would I want any less if I were in their shoes. Besides that I asked the woman who knew the prisoner was he remorseful and she was very quick to answer me that he was full of his own importance in now being a music teacher with no thought for his victims so have the authorities taught this man the lesson he needed which was to show remorse for the misery he caused his victims. I don’t believe that the authorities have served either the victim or the prisoner’s needs. What punishment did this prisoner get in prison when he got free education that many young people are paying thousands to get that and early release into an excellent job that many would love to have. Most ordinary people avoid crime because they know the consequences are severe and they work hard to get enough money to send their children to higher education and they do not want to hear that authorities are allowing prisoners free education and a free pass as they have to abide by the law of the land and they believe everyone else should. It isn’t about what I think but the reality of how people view what is going on in the country and are not happy with it. from the wrath of God. shall we be saved by his life. 11 More than that, we also rejoice in God through our Lord Jesus Christ, through whom we have now received reconciliation. I’ve been reading about Trinitarian views. Some see Jesus as co-equal with God the Father, some see Jesus as lesser yet equal with God through eternity. How we see Jesus within the trinity may have some bearing on the joke. How do you see Jesus? Angry, bitter and hate filled people have often suffered to make them like that and that is what I need to understand and I have learned that from living in Northern Ireland. What happened here made me an angry, bitter and hate filled person but I had my dad showing me a very different example and so I have mellowed and learned and is struggling but hoping and praying God will change me to be a better person and that is the most I can hope for in the flesh. When I was that person I did not see my need for Christ and I cannot make another see their need as until I feel convicted for my sins I am blind to them. I have to see that my sin is against God and not others because until I see that I will excuse my sin against others because they have sinned too. Blindness is widespread today as many see that the Jews and the Romans crucified ‘Christ’ but so did you and I and that is one truth that we don’t like but like it or not it is still the truth. scriptureunion had a good devotional about communication and how we need help with it and oswald chambers has a good one on depression today. it is amazing, God in everything even the little things. not to be missed. for His Glory and our Good. Yes Viv, it is a very sad state of affairs not to realize that it was my sin that Jesus went to the Cross for and for that I am so very grateful. That is what brought me to Him in the first place knowing that He did that for me. His love was so sacrificial and so undeserved. I fall on my knees in thankfulness that someone could love me like He does after the things I have done and the things that still lie before me as well. Totally AMAZING GRACE!! It is so easy to be blinded and why I can understand now Jesus’s request “Father forgive them they know not what they do” and it’s not until you realise your own blindness that you thank God for Jesus’s plea as how often have I been blinded to my own shortsightedness in seeing that often my omission is just as great as my commission in regards to sin. I think one needs to realize they are sinners before they will finally open the door! Thank you deb and Viv for the great testimonies, very encouraging! Street thank you for the heads up, both were very encouraging also. This beautiful song from Charlie Landsborough from Sunday morning reflections. Beloved, I thank you for telling the story how God saved you from the cold! We are powerful in Christ! Everything that dies in Christ on the Cross, is resurrected in great power! I knew that, but … everything…. That the Church, grew when it was persecuted in the first few centuries. Christians were sold as slaves, and send all over the ancient world, and so Christianity spread. Everyone we get a blow, we grow! Nothing will happen to us that will harm us, when we are IN Christ. Forever I was just reading last night that we don’t get a blessing until we go through severe testing/difficulties. No troubles –no blessing, no growing closer to God. I thank God for all my troubles. For all those who cut me off in traffic and those who irritate me, thank you LORD. We fight the world flesh and devil, but knowing God allows even sends troubles to purify and glorify Himself I’m all in. To God be the glory, always! To purify US, and glorify Himself. Our teaching in church today was about Ezra 4 doing the right things and still facing opposition not only from those around them as they were rebuilding the Temple but that is what we face when we are doing God’s work of any kind. The devil discourages, promotes fear and spreads false accusations because after all he is the father of lies and deceit. The Pastor talked about knowing how the enemy works and be on guard. The enemy does not want us to grow close to the Lord or open the door to our heart to receive Him. As long as we don’t fill our minds with the things of God there is nothing there to be in opposition to. Filling our hearts with hate, anger and division rather than love the enemy wins again. But he, the devil, is used to winning even in the hearts of those who call themselves Christians. The world distracts and the gentle, quiet whisper of the Lord often goes unnoticed except to the eyes and ears trained to see or hear because they have grown close to their Good Shepherd. And Why do loved ones have to die? In our humanness the devil can cause us anguish and doubt because while in the flesh we are constantly under attack but we know that God has overcome the world and the devil so whatever little devil is troubling you today look up to God and know He has overcome and you are not alone. Remembering that Jesus never leaves us or forsakes us and He’s only a prayer away strengthens our resolve so that we run the race with endurance knowing our strength is not our own but His because without Him I can do nothing. Telephone to glory, oh, what joy divine! Not only do we get to talk to Him but He also talks to us through His word, His songs, Nature, sermons for those who go to church or by whatever means necessary to let us know we are loved, forgiven and of much value and worth to Him. So open that door and let Him in and your life will never be the same, to find out what we have been missing without Him in our lives. Where do we go from here in Your presence? How do we continue to live our lives the same? Right here in Your presence? We forgive because He forgave us. We show grace because He first gave it to us. We are servants because He first served us. All the things in us that reflect Him are because He lives in us and we allow Him to live through us. So there is no boasting only submission, humilty and gratefulness, lol, in that order. How does a Christian showcase Jesus in their lives? It certainly isn’t by boasting how spirit filled one is because that is pride filled to say the least. So how is it we can showcase Jesus in our lives, isn’t it by sharing our need of Him? If one feels that they are good and looks at the sin in others while neglecting the sin found in their own life then there may never be a knock to answer because that person does not have a need for Jesus or the “Good News”. When God knocks at our door don’t we need to have a broken spirit and a repentant(contrite) heart, that is what pleases God(Psalm 51:17) That is a life long need. Showcase Jesus by sharing all that one has been forgiven for and the need for daily forgiveness and mercy. Hear my cry, O Lord. Pay attention to my prayer. that we might learn to fear you. I have put my hope in his word. yes, more than sentries long for the dawn. for with the Lord there is unfailing love. from every kind of sin. A quote from C. S. Lewis to remind us that God wants us to see the beauty in each other and I am thinking when I am seeking beauty in others it might just rub of on myself in the process. Lewis was a very Godly man. As the fire that came down from heaven in Elijah’s time (1 Kings 18:38) swallowed up all of the water to show that it came from God, so this fire will consume all of our corruption. No affliction outside of us or corruption within us will quench it. In the morning we often see clouds gather around the sun, as if they would hide it, but the sun overcomes them little by little, until it comes out in full strength. At first, fears and doubts prevent the fire from breaking out, until in time it gets above them all, and Christ prevails. And then he upholds his own graces in us. Grace conquers us first, and then we by grace conquer everything else, be they corruptions within us or temptations outside of us. i don’t think we conquer too much, but are conquered by Grace and Mercy. learning to be Mastered by Love and not pride. i do know God doesn’t want any to perish, but we know many do. learning to live next to tares or in a foreign temple is interesting. thinking of naaman when he was with the king when he worshiped his god. he asked the prophet to 18 In this matter may the Lord pardon your servant: when my master goes into the house of Rimmon to worship there, and he leans on my hand and I bow myself in the house of Rimmon, when I bow myself in the house of Rimmon, the Lord pardon your servant in this matter.” 19 He said to him, “Go in peace.” So he departed from him some distance. to be distant from a prophet is one thing but being distant from God is another. thinking how confused the people were with the scribes and pharisees. faith is a great gift. Unprofitable servant comes to mind. I suppose if we list the changes inside and out and call them our own but add , yet only by the grace of God!, the danger is real. Good tweeking, street. The wicked will not rule the land of the godly, for then the godly might be tempted to do wrong. i think God wants to see Himself in us, made in His Image. like a silver smith smelting silver. he knows it is hot enough or done when he can see his reflection in the ore. i notice too that the silver will be at rest too. Oh Viv, that quote from CS Lewis yesterday was just beautiful and thought provoking. Maybe that’s why I find it so easy to despair as there is much in me that I do not see as Godly and so I know what is right but struggle to do what is right! In my case the apple hasn’t fallen far from the tree and I seem to understand my first parents especially Eve’s plight much better now. But to an old rugged cross He’d go for, who am I? Yes, Pooh, that’s what I like about C. S. Lewis, his writings make you think deeper and if ever a mind knew God this man’s did and perhaps why he was such a genius with words. Yes he was gifted in that area. God gives each of us a special gift to use to display His Glory. jeff said Maybe that’s why I find it so easy to despair as there is much in me that I do not see as Godly and so I know what is right but struggle to do what is right! we can despair, but, in and with hope. bless er those who hunger and thirst for righteousness for they will be satisfied. we are told of a wise builder who had to dig down through the dirt to get to the rock. i wonder how much dirt/pride we have to go through to get to the rock. all your heart comes to mind. if i remember right the good stuff falls to the bottom and the chaff moves away by the slights breeze. to be settled on the Rock, a place of rest. it is Gods will that His children be sanctified set apart. set apart from what? darkness. the law was give so the darkness could be felt. you can’t see darkness it is the absence of light. Jesus is the light of the world. how do you explain light to a blind man? with God all things are possible. there is not plan that He can not carry out. even giving life to a dead man. giving strength to the weak. His Word will not return to Him void. His Word accomplishes everything He sent it out to do. His Word is the Good Shepherd and He lives. He has given us His Spirit. jeff i have been trying the idea of rejoicing when temptations/trials come my way as it says in James. in order to build perseverance. i think of God laughing at the plans of the wicked. the Bible says God can not be tempted “period” i usually moan when the problem arises. like her we go again. laughter is a very interesting response. david prayed that His enemies would not/continue to rejoice over him. someday i will see david. i hear our joy will never be taken away. the joy of Christ. The deeper my confidence in God the easier it is to let- go, laugh even at myself and whatever is troubling me. All of us characters are rewarded by hope! That is foremost an admonition for myself! So then, it is true, that suffering produces perseverance. I think joy is not about the problem, but knowing that in spite of the problem we have a precious Hope, Jesus and eternity with Him. All those who have gone before attest to this. Sometimes just saying thank you Jesus through clenched teeth, but the morning always comes, with joy! I’ve never been disappointed taking one day at a time. In the mean time I suffer pain, sorrow, sadness grief anger disgust and on and on. But they never last! Only Jesus and faith in God last with eternal rewards. A reality self check is to remind myself that tomorrow is gone, today is pure gift, and I’m not promised there will even be a tomorrow. He’s with me, always. I was just reminded of Chris’ s ministry to prisoners. How can a Christian behind bars with a life sentence experience joy in those circumstances? If it were me it would take knowing Jesus to have any joy at all!! don’t think we have ever seen what God does with sin. we see it better at the cross but not the cross of Christ. He was innocent/unblemished Lamb. we sometimes say they got what they deserved. i think this comes from a self perspective. what He did to His Son as bad as hard as we try to understand, could not come close to the wrath of God. mans wrath ends at death of an individual. beating a dead horse comes to mind. a sustained eternal perfect suffering is difficult, is explained in the Bible. even the idea of everything you think you have will be taken from you. yes everything we have here will pass away eliot famous saying a man is no fool to give up what he can not keep to gain what he can not lose. the hardest thing to give is self. i don’t think it can be done apart from faith in God Hope in God and Love in God. i remember Jesus recording the extravagant gift of 2 mites. paul spoke of some that gave themselves to the Lord first then gave them selves to the work paul was doing. he encourage titus and the rest to complete the task that was started. i hear love finds away. jeff i have been trying the idea of rejoicing when temptations/trials come my way as it says in James. I seem to do more sorrowing these days but I think it is because I see my weaknesses more and despair that they haven’t improved much so that my desire to be is not matched with any accomplishments and I find myself lacking in motivation as to what to do when what I do falls so short of achievement. If you understand where I am coming from or getting at. Mart wants us to look at how unbelieving people do think. Why do I have to be rescued? If life is OK, if the society you live in, is well organised, if you have a good education, a good job, a healthy body. Jesus said that only the sick need a doctor. I think He was saying: when people are convinced int their hearts that they are sick. the only thing I can do, is pray, that God will intervene in such a person’s life, and there will be a need. Because he needed to be freed from these voices. And that how he found the Cross. Spurgeon heard these words when he was walking in the snow, anbd was driven to this little church, and the pastor preached these verses from Isaiah 45:22. So if a person does not see the need of a “Rescuer”, I pray. This morning we sang: You are beautiful to me. I looked up and saw the face of the elderly woman sitting opposite to me, and shhe had a lovely smile on her face, it was just beautiful. Someone had been writing here that some of Jesus we can see in each other, was it Street, or Beloved. Only Jesus can save us, and give us His strength! He died so that we should live out of His life, His life flowing through us, as long as we look up to the Cross, and in the looking we are healed bit by bit. Such a prophecy for Jesus on the Cross. Unbelieving people do not think God exists so they are not looking to be rescued when this world is all they believe they need. I cannot seek God unless I believe He is their to begin with. Faith is a gift as it is what creates in me the desire for God in the first place. I cannot make another see their need of God but God can and will as and when He sees fit. As you say, Forever, prayer puts it in God’s hands and He does the rest. I do not think it is just the unbelieving population that does not see their need but those who “say” they are Christians but seem consumed with the sin they see in others and those who have been Christians for a while who seem to forget that they still have that same need and will until the day they shed this flesh. I guess it depends on who one’s focus is on! I first saw my need for God as I thought He was the only one who could save me from abuse after telling all the adults in my life and they unable to help me, though some tried but going to law enforcement was not an option in the ’50’s. Though the abuse continued well into my 30’s I still had hope God could help and heal me, along with my father. It was at 30 I recognized MY sin and need for a Savior, not just for my wounds but for my depravity/sin nature. God opened my eyes through Billy Graham, bless his soul. The eyes of my heart were opened. It made things more complicated for me and still does sometimes if I’m honest. Sometimes I dislike God for what He shows me about myself. It just seems hopeless, but then I remember His great love, dying for me!! So I can live with Him forever! Amazing and astounding! I no longer have to fear death, something I’ve been afraid of since I was little and told many times my life could end suddenly for speaking about the truth. Big smile here, oh how I love Him! Beloved, I struggle at times with what God shows me about myself until I eventually get to the place where I see it is for my progress and not to punish me. Jesus is a great refuge while I huff and puff and come to my senses that God’s discipline is necessary. I have had a fear of hell since I was little and during my manic episodes I have had bizarre visions which have escalated it and why I have to focus on God’s love rather than His wrath in seeing God. Focusing on Gods love is what Mart is all about! Jesus was right we did not know what we were doing. the greatest miracle of all, happening in plain sight, the removal of sin from God’s sight in a single day. freeing prisoners from darkness and looting the house of satan. no one knew or understood what happen till Pentecost. even their witness was a witness to the work of the Holy Spirit. thinking of Jesus asking the pharisees if the baptism of john was of man or of God? the scripture said they feared the crowd, not God. Like the first we are offered a place of safety on the Ark. Jesus knocks at the door and warns us of a coming disaster. steve as i read this i saw something i never saw before. what if the knock came when i walked by the narrow door? we were on the outside and heard a knock and entered into the ark/Christ by the narrow gate? Jesus is saving us from a city/body of destruction for His Kingdom not this world. sure we become subjects to a new Ruler waiting for His return. but we know we will return with Him when He comes back. living with a Helper. i think Jesus passed though samaria because this woman was looking for the Messiah and stated it so in their casual conversation. He did show up! the woman caught in adultery was not looking for a Messiah, but found One unexpectedly, like the thief on the cross. i am absolutely amazed at Jesus total control of all circumstance He encountered and these are just the ones that are recorded! yes love is apart of it, and the will of God. the same yesterday today and tomorrow. happy are they that find Him. thinking about steve and jeff’s post together. the protestant and catholic story. it’s interesting that both side would agree that murder is wrong, bombing, extortion and the rest. yet they can not agree how to throw the wicked out. david had a very distressing problem when he fail to deal with joab and absalom. thinking further the woman caught in adultery, some say what about the man???? ok lets stop here before we go any farther. first lets see if Jesus can save the woman? as we know He did. what holding you back from the door? david did charge solomon with dealing joab and shimei. just thinking maybe a new way forward?